While I enjoy headsets, I’ve never really had a proper gaming one, not just for PC but also my home consoles. There are always too many plugs or they’re just too complicated to get connected, particularly with component-based accessories. However, Steelseries has taken a great approach to their universal headset for multiple systems with a much more intuitive and elegant approach. The headest comes packed with all the necessarily cables you need to hook it up through your PS3 or 360. PS3’s a little easier since the 360 will require a lot of plugs–you might end up looking like you have plugs all over you, as if you were in the Matrix. Regardless, the sound quality is impressive. whether you’re playing simple games like Spelunky or music-intensive ones like Sound Shapes. While using the headset, I could hear all the intricacies of each instrument. Sometimes I’d notice things in the background a little better too. Let’s not forget about the look of the headset though. It’s not a futuristic space-set design, which I like. It looks more like a simple pair of headphones. The mic is so hidden, you might not notice it at all. You can extend it as well, if you want it closer for better voice pickup. The fact that it’s not a headset I’d be embarrassed to wear outside is amazing. 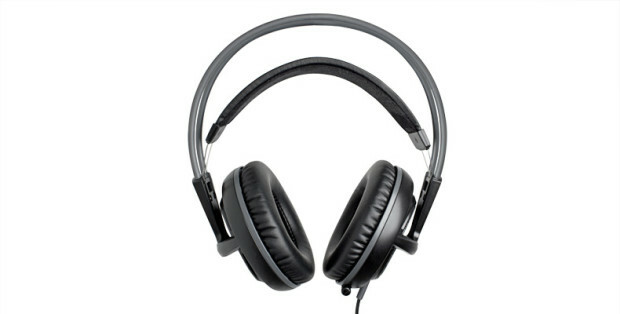 It looks like something that any big cans-wearing headphones lover would wear. There’s also strap you can easily rest your neck on that goes well with the cool wire-frame look of the headset. A minor setback of the headset is that the cord is a little short. Bear in mind, this’ll affect people in different ways; for instance, if you have a laptop, this probably isn’t a concern for you. But if you have a desktop and you need to be getting up a lot or perform any type of strenuous work, you might accidentally yank yourself back and remember you’re wearing headphones. The cord is a bit longer if you are playing on your Xbox 360 or PS3. On the other hand, there’ll be way more cord on the ground for the Xbox if you’re running component, but HDMI should be more convenient. Overall, this is one of the best headsets on the market if you’re looking for cross-compatibility. Being able to intersect the headset with a lot of devices is great if you game on a myriad of platforms. Steelseries has made an impressive headset that you can go outside with as headphones and still blast guns with high-octane sound in your living room interchangeably.